There were demands for kinetic energy charging. There were form factor imaginings distinguished mainly by 0.2 inches. There were claims that Apple was turning to Qualcomm for processors and counterclaims it was turning to Intel. And hopes for at least one Next iPhone sometime to be released between June 1 and August 31. Technically, this isn't a rumor. It's one of those iOSphere Mandates that regularly loom out of the collective unconscious. The mandates are always about what Apple "should" do or include in the Next iDevice. In this case, Apple should include a kinetic energy charging mechanism in its next high-end digital device. The mandate was issued, apparently, by Mark Chubb at PhonesReview, a U.K. tech website. "iPhone 5 battery life in most cases is fairly poor, and even though it comes with a lightning charging connector that does rapidly charge it also drains very quickly indeed when playing games or watching videos, and then when it is time to make that important call the iPhone dies on you," Chubb begins. That's a mouthful, but we get it: "fairly poor" battery life. It still seems to surprise mobile device users that if you continuously watch videos and play games. Then. The. Battery. Dies. "So Apple should do something completely different for the iPhone 6 and use the Ulysse Nardin kinetic battery tech," Chubb announces triumphantly. Thank heavens someone is using the brains God gave him. For those of us who are not counted among the Idle Rich, The Chairman, by the Swiss luxury watchmaker Ulysse Nardin and Scientific Cellular Innovations, is a $130,000 or thereabouts gold-and-jewel-encrusted Android smartphone, complete with such "advanced" features as a 3.2-inch display, 32GB of memory, 8-megapixel camera and fingerprint sensor, not to mention an elaborately hand-crafted storage-and-dock box. And it has the astonishing, the wondrous, dare we say "magical" Ulysse Nardin Rotor, a mechanical watch rotor which creates kinetic energy to supply supplemental power to the phone. "There is surely a way that Apple can incorporate this into the iPhone 6, not only will it give you vital charges for a few minutes it also looks stunning as well and adds that class of engineering on show," Chubb enthuses. Personally, The Rollup believes if you're going to take a step backward, take a Big Step backward to something even more retro. "The iPhone 6 can have style, class, engineering beauty in working motion, just imagine having the iPhone 6 on your ear and all others seeing the kinetic rotor moving whilst you are walking etc., eye candy at its best if you ask us." To sum up, the iOSphere Consensus Rumor at present is that Apple will announce in 2013 at least one, or two, or three iPhones, some of which will have screens that are larger, or smaller, than the 4-inch iPhone 5. Since things like details are missing, let alone credible sources for the details, "concept artists" have leaped into the breach. This past week alone, there have been three (3!) breach-leapings. One, from AppleInsider.ru, helpfully Englishified by Google Translate, predicts a 4.2-inch iPhone. In other words, an iPhone with a screen that is 0.2 inches larger than that of the iPhone 5. The French tech site NoWhereElse did the Russians 0.4 inches better. 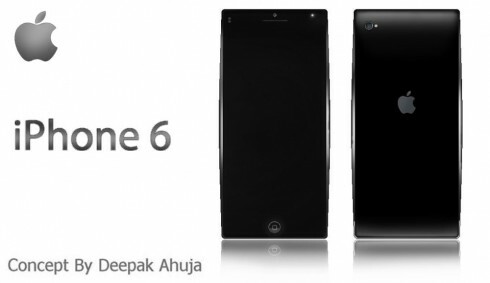 They created the iPhone 6 with a 4.6-inch diagonal, edge-to-edge display. In a masterpiece of understatement, Cult of Mac's Buster Heine remarked, "There are a lot of crazy rumors floating around out there about the iPhone 6." But the folks at ConceptPhones.com, searching high and low, discovered a bit of fan art with 0.2 inches more of ambition, or perhaps of craziness. 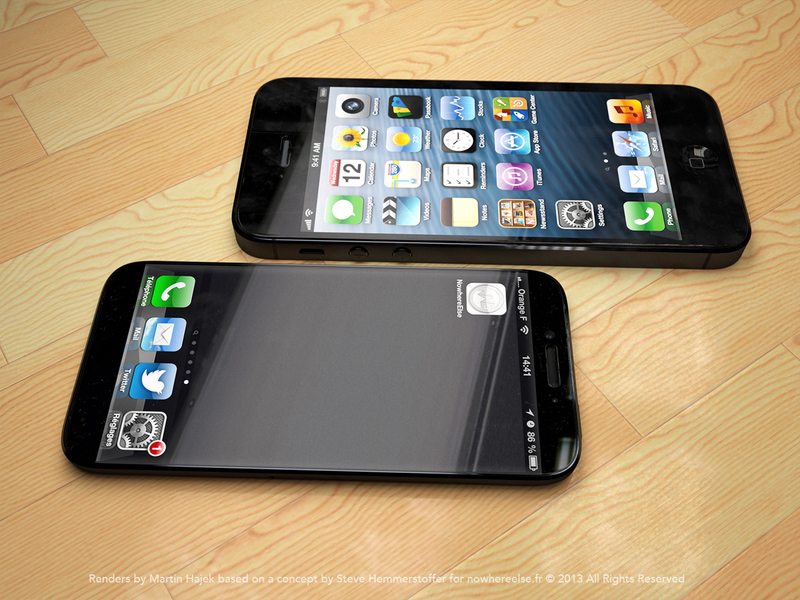 This one imagines the iPhone 6 with a 4.8-inch display. "The device seems to have a curved design, but it's very elegant, sort of like a modern muscle car, if you want a comparison," according to ConceptPhones. There are plenty of other decimal points remaining between now and whenever the Next iPhone is finally released. One of the Next iPhones -- the cheap one -- will scrap Apple's own ARM-based A Series chip designs (which are then built by Samsung) in favor of Qualcomm's existing Snapdragon SoC, according to a Chinese-language story by China Times, picked up by the Japanese tech blog Macotakara, and thence by sites such as AppleInsider. China Times cited "an unnamed industry watcher as saying that Apple plans to use Taiwanese chipmaker TSMC's 28nm process to build the cheap iPhone's Snapdragon SoC. If true, the switch away from Samsung's foundries would be a first for the Cupertino company, which has pushed increasingly further into chip design with its latest A6 and A6X processors," according to AppleInsider. But a foundry shift would be much less important than a decision to switch to a third-party application processor, in this case the Snapdragon. Currently, iPhone models pair Apple's A Series processor with a Qualcomm cellular modem. As AppleInsider notes, Qualcomm markets the Snapdragon as a stand-alone processor or as a system with integrated communications components. Using the most advanced 28-nanometer process, the Qualcomm package offers high performance, smaller size, lower power demand, and fewer discrete components. "If Apple is indeed planning to launch a cheap handset in developing markets, the use of an all-in-one platform could save on component costs," AppleInsider comments. "Some Snapdragon iterations also come with 4G LTE compatibility, though the publication claims that Apple will stick to 3G for its initial low-cost iPhone." Both Qualcomm and Apple have two types of ARM licenses: one license for using ARM's CPU cores, running the latest ARM instruction set, and a second license that lets the companies custom design the cores to run that instruction set. Apple's A6X chip was the first to offer this custom design. Presumably, if Apple is planning to create a lower-cost iPhone, the Qualcomm integrated SoC would have to offer significant savings compared to Apple's current solution. Faithful to the spirit of rumor, we're exaggerating a bit here. The Reuters story that ignited this speculation actually only claims that Apple and Intel are talking about a deal in which Intel would replace Samsung as the manufacturer Apple's ARM-based A Series processors, which are used in the iPhone and iPad. In other words, future iPhones would use an Intel-manufactured chip, not an Intel-designed chip. Apple contracts with Samsung's foundries to manufacture the A Series processors, even as it competes with other Samsung units in the smartphone and tablet markets. "Manufacturing chips on behalf of other companies is a major departure for Intel, which for decades has based its business on using its manufacturing prowess to offer its own PC chips superior to rival products," according to Reuters. "As PC sales contract and Intel's fabrication plants operate at less than full capacity, the chipmaker sees an opportunity to fill idle production lines while earning new revenue." MacNewsWorld's John Mello found a stock analyst who thinks shifting production to Intel is a great idea. "A move to Intel would speed up the time it takes to manufacture chips for its iPhones and iPads, said Doug Freedman, an analyst with RBC Capital Markets in New York City," Mello reported. "'When you move to Intel's manufacturing process, it is, at a minimum, nine months ahead of anything available in the general purpose foundry market,' Freedman told MacNewsWorld." That would include access to Intel's advanced 14-nanometer chip process, according to Freedman. Mello also notes that "Freedman stirred the rumors about an Apple-Intel pact two months ago. In a research note, he said the deal would involve Intel making Apple's iPhone chips in exchange for Apple using Intel processors in the next generation of iPads." It's not clear if Mello, or Freedman, here mean "Intel-manufactured ARM chips" or "Intel-manufactured Intel chips," presumably based on Intel's x86 architecture used in the chipmaker's Atom mobile processor. The former would be an extension of the manufacturing deal. The latter would mean Apple adopting a different microprocessor architecture for its tablets, which doesn't seem likely. In the same post that forecast an "April-ish" release of the Next iPad [see "iPad 5 rumor rollup for the week ending March 6"], iMore's Rene Ritchie says that "sources familiar with the plans" tell him that "Apple is planning the release of the iPhone 5S for this summer, currently for August." According to those sources, the Next iPhone will be the iPhone 5S, which "does indeed have the same basic design as the iPhone 5, with a more advanced processor and an improved camera. ... With the iPhone 5S, the aim is to once again raise the bar in terms of iPhone optics, including a much better camera in essentially the same casing." And his words were like ashes in the mouths of the iOSphere. But the good news is that you may not have to wait that long to be disappointed. KGI Securities analyst Ming-Chi Kuo issued a new speculation that Apple "is expected to unveil its iPhone 5S and lower-cost iPhone alongside iOS 7 this June, with the devices coming available in July," as reported by MacRumors' Eric Slivka and a host of other bloggers and tech sites. That would almost four months earlier than the iPhone 5 unveiling in 2012. Kuo thinks that will happen for two reasons. First, "to avoid repeating the fatal mistake of last year of the delayed iPhone 5 launch, which gave competitors room to grab market share." The word "fatal" means "causing or capable of causing death; mortal; deadly" and "causing destruction, misfortune, ruin, or failure." To the best of The Rollup's knowledge there is no sign of impending death, destruction, misfortune, ruin or failure of the iPhone. ComScore's just-released smartphone market share report for January shows that of the 129 million U.S. smartphone owners, for the three months ending Jan. 30, 38% of them had an iPhone, an increase of 3.5 points from October. In distant second place was Samsung: 21% were using a Samsung phone, which was up just 1.9 percentage points from October. Kuo's second reason for the earlier release date is that "the new iPhones this year are mainly designed on the basis of the current iPhone 5, which suggests development time could be reduced." This statement, too, seems to hold a lot of unspoken assumptions. One might think from this that Apple ships one iPhone and only then starts designing the next one. Clearly that's not the case. If Apple is bringing out a cheaper iPhone in addition to an "iPhone 5S," these have been in development already for at least 12 months if not longer. And creating a low-cost iPhone, for Apple, at least, is more complicated than simply taking the iPhone 5 innards and packaging them into a plastic case instead of a machined aluminum case. Kuo predicts the iPhone 5S will have a new chip, the A7, which most commentators think will be a quad-core processor; improved camera and flash; and a fingerprint chip under the home button. The low-cost iPhone in addition will have a fiberglass-plastic outer case available in a range of colors, but it will also be heavier than the upcoming 5S model.